SUPER ABSORBENT ORGANIC COTTON DROOL BIB - Our Bibs are made with 100% Organic Cotton with Polyester Fleece in the back making them ultra absorbent These stylish drool bibs are made of 100% absorbent cotton on the front and 100% polyester fleece on the back. Keep your babies/toddler clothes clean from drool while their teething! ADJUSTABLE NICKLE FREE SNAPS - 2 nickel-free snaps allow our bibs to grow with your baby.The snaps make our bibs super comfortable and fit both babies and toddlers with a recommended age of 3 - 24 months. The snaps ensure the bib stays on your baby and makes it easy for mom to take on and off! 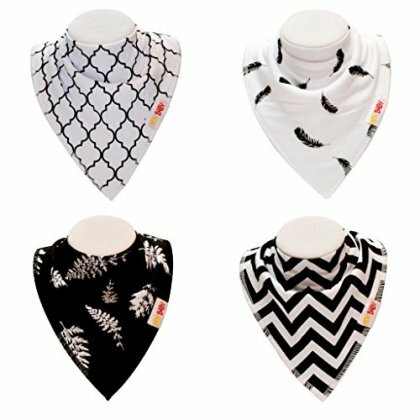 STYLISH & COMFORTABLE BABY BANDANA BIB - Our ultra stylish set of 4 bibs for boys and girls made for babies and toddlers makes the perfect accessory for your little drooler. Modern and unique patterns look great on both boys and girls. Designed exclusively to be stylish and comfortable our bibs are extra absorbent and will keep even the biggest drooler lookin good! A PERFECT BABY SHOWER GIFT - Hnybaby Bandana Bibs make an amazing gift for any baby shower. Our products are loved around the world by moms, babies and toddlers alike. These bibs will make a statement as any mom would love this trendy gift pack for their baby! PROUDLY CANADIAN BUSINESS - We are a 100% mom made business in Canada. We ensure our products are designed and created with with excellence and quality. We aim to provide your baby with the best style and function. These bandana bibs are durable and long-lasting even with babies that never stop drooling. That's why our product is backed with a 100% Money Back Guarantee. If you are unsatisfied in any way with this product, we will refund your money with no questions asked! Front is made of 100% soft organic cotton backed by an absorbent polyester fleece to protect your little drooler and teething baby. Keep your baby's clothes dry from dribble without the use of an uncomfortable waterproof layer - Stop changing your baby's clothes 3-4 times a day, just put a bandana bib on and you're good to go! Great to have on hand in your diaper bag to keep your drooly baby dry all the time wherever you go.